Jantzen Witte laced a sinking line drive into left field with the bases loaded in the last of the 10th, scoring Matty Johnson from third to trigger a victory celebration on Friday night in Salem. 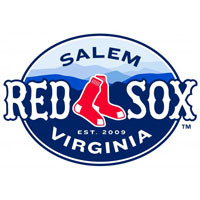 The 4-3, 10-inning triumph over Wilmington was Salem’s 10th win in its last 12 games and assured the Sox that they would remain at least two games ahead of their closest adversary in the race for the final playoff spot. The Sox overcame a 3-1 deficit with single runs in the fifth, seventh, and 10th, taking advantage of brilliant relief pitching from William Cuevas and Jonathan Aro. After Heri Quevedo set down the final five batters in his strong six-inning performance, Cuevas retired six straight in his two frames on the mound. Aro surrendered a leadoff single to begin the ninth, but struck out the next three Blue Rocks. He followed it up with a perfect 10th, paving the way for Salem’s game-winning rally. Johnson led off the last of the 10th with a bunt single, and Carlos Asuaje promptly singled him to third. After a first-pitch foul ball, the Blue Rocks decided to intentionally walk Reed Gragnani, loading the bases for Witte. And on a 2-0 pitch, Witte cracked a looping liner to shallow left. Although it was nearly caught by Cody Stubbs, he played it on a short-hop and immediately chucked it to the plate. A force play at home made it interesting, but Johnson’s sprint beat the throw, and a feet-first slide gave the Sox the 4-3 win. Gragnani led the Red Sox with three hits and two RBI, while Johnson recorded two hits and scored two runs, reaching base safely for the 23rd straight game. Dreily Guerrero and Jose Vinicio each went 2-for-4 at the bottom of the lineup, as each middle infielder chipped in with a single and a double, respectively. Aro improved to 2-0, earning the victory out of the pen, while Andrew Edwards suffered the loss, slipping to 0-3 by allowing the game’s final run. The Sox and Rocks will reunite on Saturday, with a 6:05 first pitch featuring a pair of lefties. Cody Kukuk will take the ball for Salem, while Jonathan Dziedzic counters for Wilmington.